"Upon prior experience of group trips, I booked this retreat expecting to take away a few great memories, some cute Instagram pics, and ultimate relaxation. I didn't expect to take away the cathartic, transformative week that I was provided. Pixie's fitness adventure retreat nourished me, challenged me, and left me feeling more whole than I could have imagined. Secluded on the pristine grounds of Rythmia, the lodgings provided the ultimate escapism for complete mental relaxation and clarity. With Pixie at the helm leading board game nights, group discussions at family style dinner, and processing playgrounds, camaraderie immediately ignited between everyone on the trip. Furthermore, the fitness adventures like surfing, horseback riding, and zip lining grew our bonds even deeper; getting to cheer on and partake alongside in everyone on the trip overcoming various fears of heights, or the ocean, or challenging our inner athlete, led to a unique spiritual nourishment, and physically spent but fulfilling evenings. Pixie and Surf Sweat Serve provided a connection to the beauty of our surroundings, to our own mental and physical presence, and most importantly to each other, fourteen seemingly strangers that left as a tribe, which is something you cannot put a price on. Rande and Ryan, who accompanied Pixie as part of the Surf Sweat Serve team, and the staff of Rythmia were the perfect compliment to our host. They extended the same energy, graciousness, and excitement for each individual and each experience that Pixie had. To say that the Surf, Sweat, Serve retreat was life changing, would be an understatement. This is the first time in my 15 year career I took time to honor my mind, body and spirit and throw caution to the wind. It started with my trust in you. Knowing your attention to detail, understanding your holistic approach to wellness, mindfulness of each of our individual needs, your adventurous spirit, and your boundless love of the water, animals, the environment, giving back to the community and your outward encouragement of self love, it was undeniable for me to not say yes. I surfed and zip lined for the first time in my life, which was a total blast. Communed, played, danced with the beautiful local people, animals and the waves, and every day looked forward to whatever amazing adventure, or self care, yoga, run bike, massage, colonic, rest and relaxation that was to come. ..but most importantly, you brought together a group of the most incredible humans that I am now bound to for life. The joy, the spirit, the love, the laughs, tears, breakthroughs will never be forgotten. For all of this, I thank you, and I of course, can't wait until the next retreat. I’ve known & loved Pixie for a few years, when she said I’m doing a retreat I jumped in the chance to go. Of course as soon as I said that I became fearful that it was going to be a Uber fit people with non stop workouts the entire trip. How wrong I was!! Pixie & Surf sweat serve greeted us all with warmth, joy & her infectious excitement—this set the mood for our Journey! From day one there were laughs & delicious food-not uncommon to have 2 breakfasts;). Costa Rica & Surf Sweat Surf hosted us for a week of awe, love, adventures & most importantly nurtured a community amongst us travelers. 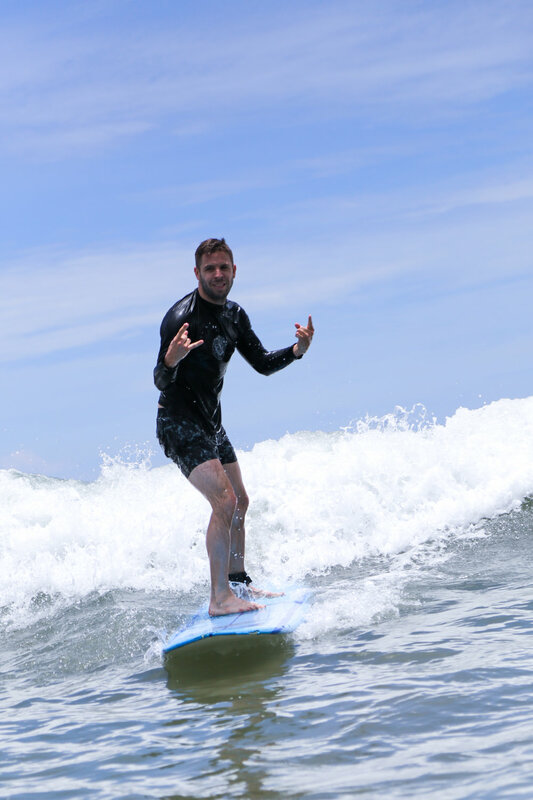 I could speak of the surfing and how I am a natural, I’ll probably be on the competition circuit next season but that isn’t the only take away from this trip. For me the most important & special were the friendships cultivated from kindness. We all stretched our limits be it fear of heights, swimming difficulties or fear of ocean etc... & we were cheered on/supported by our new crew of friends. Magnificently this community grows stronger now that we’re back home into our regular lives. I don’t think OGSSS would’ve been possible if our leader hadn’t created the space for this. Pixie & her team thought of the details so we could revel in the gifts this retreat had offer. Seriously, don’t get me started on the arrival goodie bag!! I wanted to take the time to provide my feedback regarding the surf sweat serve trip that was organized over the summer. The trip far exceeded my expectations in so many ways. First, the activities were well thought out and organized in a fashion that flowed with the right cadence. 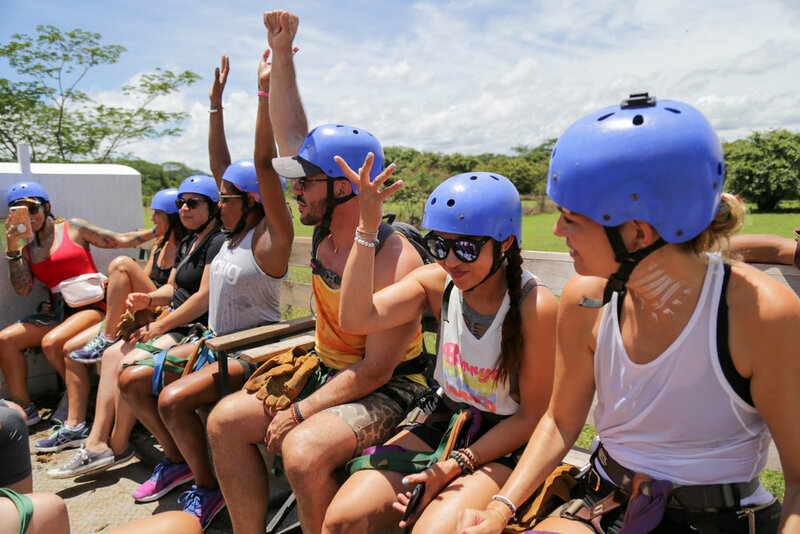 I loved all three activities of surfing, zip-lining and horse back riding, and it was clear that there was a lot of preparation because everything moved effortlessly. As the leader of this trip, you have an incredible gift of bringing a group together and creating a "bonding feel". This was evident in the small workshops that we had in the evening which helped all of us connect more, open up and appreciate each other. In fact, as soon as I was added to the email list of "Surf Sweat Serve, I began to feel an incredible sense of community and you created that feeling. This sense of community was amplified on the trip especially during the beach clean up when we were able to give back to the locals. All in all, the trip was perfect, I had plenty of time to relax in the pool or the spa with the multiple massages that were included, I felt spiritually renewed due to the workshops or the incredible yoga classes and the location was breathtaking. If you are looking for a retreat that touches every aspect of "FUN" this is the trip for you! Thank you so much for informing me of this trip, and when the next trip is being planned, let me know because I'm ALL IN!